This former professional racecar driver turned California winemaker joined us in the Montagna Bar this week to talk wine, life, Aspen and how fast you can go on a snowmobile. What brings you to Aspen? What usually brings me to Aspen this time of year – having fun and skiing. 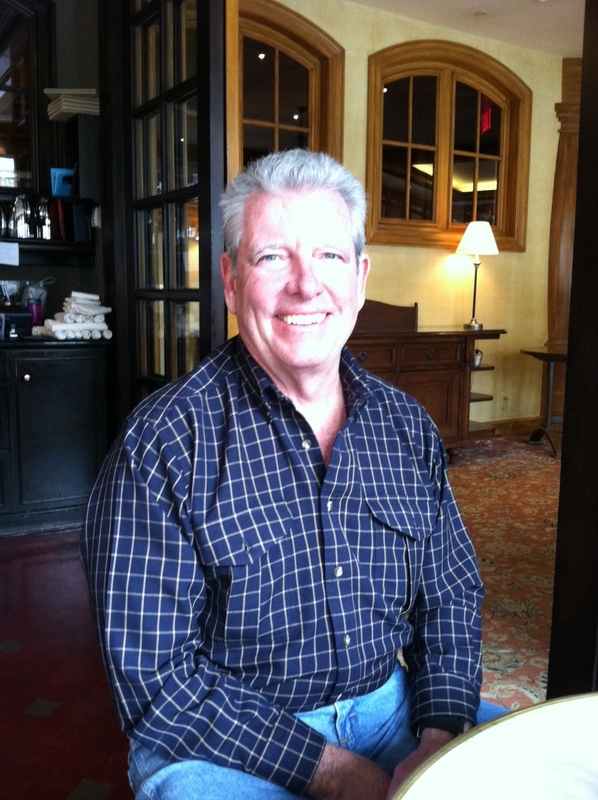 I’ve been coming to Aspen since the late 1960s when I came to ski during my college years. I remember staying at The Little Red Ski Haus. I started spending more time here in the 1980s during my racing career, and I participated in the Colorado 500 Dirt Bike Ride 13 times, which brought me to Aspen a lot. Today I went snowmobiling with some friends for the first time pretty much and tried to go as fast as I could. I have so many friends here – friends I’ve been seeing in Aspen for the last 25 years! Plus, I like to check in with folks like Jonathan (Jonathan Pullis was the master sommelier and the wine director for the former Montagna Restaurant at The Little Nell). I always enjoy being in one of the best wine towns in the country for my winery, Lewis Cellars. So how do you go from being a professional racecar driver for over 20 years to making wine? I finished college in California near Napa, so I was exposed to wine early on… but I was broke. It wasn’t until I was traveling in Europe with my racing career that I really became inspired. I had a wine group I was in. I started drinking Zinfandels, and then when my racing went better, I started learning about Bordeaux. While I was racing, my best friend bought a vineyard, and I just thought it might be time to make a change. I’m really lucky. I’m still doing something that I love. What kind of wine do you make, and where can you find it in town? We primarily produce cabernet, but we also produce a lot of chardonnay. We’re making about 8,500 cases a year, which is the right number for us. You can buy it at Grape and Grain as well as Aspen Wine and Spirits. Of course we are at The Little Nell and Ajax Tavern, and we’re also at Pacifica, Cache Cache, Matsuhisa and a few other locations around the valley. You created a wine with Lance Armstrong for the LIVESTRONG Foundation. How did that connection happen? Well, I met Lance at the Tour de France in 2001. He later came to California and dropped by the winery. We decided it might be a good idea to do a wine together, so in 2005-2006, we got serious about it. He would come out and taste, and sometimes I would send him two bottles marked “A” and “B” and he would pick which one he liked better… we worked through that process for a while. We released an ’05 and an ’06, and this year, we will release the ’07 around the Tour de France. I’ve been involved in LIVESTRONG events, and we had one this past fall in Aspen. Plus, I’m a road biker, and I love riding in Aspen on all the passes. Whatever Jonathan suggests! Aspen is such a great wine town. While I’m here I like to try something different, so nothing from California. I’m enjoying some Austrian whites, white Burgundies and some Northern Rhones. Basically, surprise me. I’m happy drinking most anything in Aspen. 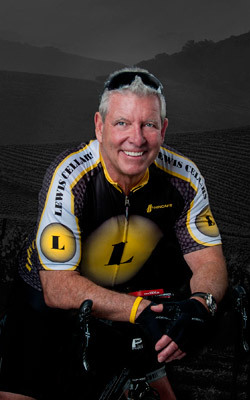 Randy – decked out in his Lewis Cellars bike jersey.